A dance work that captivates ‘an audience so much that they are actively engaging with the performance’ is how choreographer and performer Natalie Abbott describes Physical Fractals, her latest piece. Following on from its recent inclusion in Melbourne’s Dance Massive, where it both impressed and disorientated audiences, the piece will be performed at Sydney’s PACT Centre For Emerging Artists later this May. I spoke with Abbott to find out more about her innovative dance work. Physical Fractals emerged from Abbott’s desire to intensify the audience experience of dance performances. As she explained, she ‘wanted to give the audience a visceral experience to take home, so that they are part of the performance’. This is achieved by what Abbott describes as ‘bombarding the senses visually and aurally’ through repetitive movements that have a disorientating effect on the audience, which are seated in two semi-circles around each side of the performers. The circular nature of the performance space is intended to reinforce the recursive elements of the piece. Abbott began developing Physical Fractals in 2011. 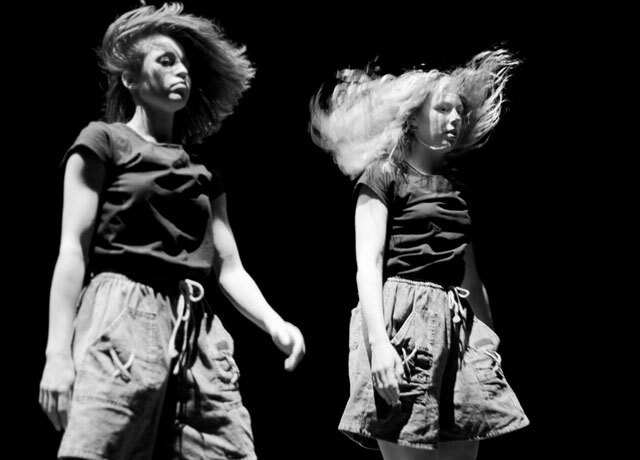 Its development was facilitated by the Next Wave Festival’s Kickstart Program. Over this time the piece has gone from featuring a group of performers to just two, and been performed in different spaces, changing in response to each new environment and audience. Sound and light combine with movement to bring Physical Fractals to life. For Abbott, this combination has the ability of ‘making simple things a bit more spectacular’. The ‘simple things’ to which she refers are the simple movements she and her co-performer Rebecca Jensen make. The subtle details of the choreography are repetitive and give a sense of rhythm and continuity to the piece. The title, Physical Fractals, appropriately reflects the fragmented nature of the choreography. Abbott decided to include the word ‘fractal’ after the piece was developed, as she saw parallels between the fractals that appear in nature and the rhythmic, yet imperfect, repetitions in her work. This is seen in the way in which she and Jensen perform the same movements, yet do so in slightly different ways. At times, this leads to breaks in unison which, rather than detracting from the piece, Abbott sees as a strength, observing that ‘the mistakes become the choreography’. Abbott, a choreographer and performer who demands her audience’s full attention, has put together a piece that does just this. Physical Fractals is an ambitious and compelling dance work that promises an immersive experience that will captivate, uplift and disorientate audiences. ‘Physical Fractals’ is being performed at the PACT Centre for Emerging Artists, Erskineville, Sydney, from 1-10 May, at 8pm. Tickets are $24 or $18 for concessions. See the PACT website for more information. This entry was posted in Art, Arts and tagged choreography, dance, sydney. Bookmark the permalink.